Prices: generally range from $500 for a 400-watt turbine, $6,000 for a 4 kW turbine, to $50,000 for a 20 kW turbine. Towers: $5,000-8,000 for a 30-50 foot tower, and $12,000-30,000 for a 80-120 foot tower (the higher the tower, the more efficient the wind energy). Installation: this all depends on the location's terrain and the tower's height. Depending on the type of wind turbine, you may need to buy converters or batteries. These can range from $3,000-7,000. Maintenance: generally, you'll have to pay 1-3% of the initial cost for maintenance of the wind turbine (necessary for peak efficiency). This mean that for a $20,000 wind turbine, the maintenance per year will run from $200-600. The government has committed $150 billion on energy subsidies for wind, solar, and nuclear power. However, 96.3% of this has gone to nuclear power. That means that $1,411 per household goes towards nuclear power, compared to the $11 per household given to wind energy. In 2008, wind energy consumed only 1.5% of world-wide energy usage. As of May 2009, 80 countries are using wind energy on a commercial basis. The average cost of regular residential energy is about 12 cent per kWh, compared to only 1 cent per kWh for wind energy. The marginal cost, once a plant has been formed, is less than 1 cent per kWh. This is incredible-this is why wind energy is smart and I think it should be in our future. The capital cost (making the wind turbine and plants) is the biggest part of the project, but once they are up the amount of money that we save is huge. In 2050, I would hope to see much more use of these wind turbines, especially because down the road, energy costs will continue to rise. When these costs rise, the price of the wind energy is only in the initial capital costs. There are not only long term advantages in the direct costs but also in the indirect costs. External costs take into account things like greenhouse gases and the burning of fossil fuels, which may lead to global warming. We must remember that wind turbines do take space and we must create room for them to be located, but it's a trade off- the amount of resources regular energy fuels (like coal) take can be much more damaging and invasive. In 2009, a 30% tax credit was offered to those who used wind or solar energy. Some states even offer exemption from property tax or mandated purchases. Those who invest in wind energy can have the honor of claiming themselves as part of the "green effort." The Energy Improvement and Extension Act of 2008 has created additional wind energy incentives with tax credits. As parents, grandparents, and students way play a key role in the way future generations will have to live due to our poor choices on energy use. We have to be asking ourselves what we can do to help use energy more efficiently. So why isn't Holland brimming with turbines all over instead of containing only two. This seems like an easy thing to say, but to actually build and put up turbines is a whole other statement. It takes resources, time, and most of all lots of money to make a turbine.So come and take a look at what it all takes to make your own wind turbine. The average turbine is 34 inches round and has a 17 foot deep base made of solid concrete and as the height of you turbine increases, the deeper the base has to be when building. 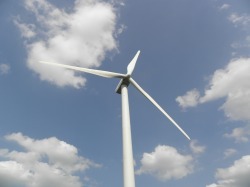 The shortest turbines are 45 feet tall with 12 foot diameter blades. The Skystream located near the Civic Center is an example of a short wind turbine. It will take around 2 months to get your turbine up and running due to the waiting of parts and pieces for your turbine. With all that said and done, you still aren't even able to build anything yet because you need a building permit from your county. Added on top of that, the agricultural zoning has to be under 110 feet and if the turbine was to fall it would have to land within the property.Once you get past all of that you need to decide where would be the best place to build your turbine. Conditions that make your wind turbine work best is when there is nothing to block the wind, no trees within a half-mile radius, and is located 6 miles off the lake. Now with your turbine actually up and running the savings begin. Energy is produced at wind speeds of about 4 mph and at 35 mph the turbine has reached its speed ceiling and it does not produce more energy as the wind gets faster. When winds are too high the turbine will actually shut itself and will reset. The turbine will also shut down automatically if the power is off. To get the most out of your turbine battery packs can be bought to store electricity that you aren't using right away. Did you know that turbines average 15 kilowatts per day over the span of a month? Tracking software is used to check the production of the blades to see how much energy the turbine produces. Whew! That was a lot of work put into that turbine. So how do you know if it was all worth it? Well the first thing is that turbine blades are expected to last for around 20 years before they should be replace. Second, it takes approximately 10 years, at 10 cents/kW hour, to pay off the costs of putting up your turbine.